Q. Finding older and/or non-UAH dissertations on Proquest. 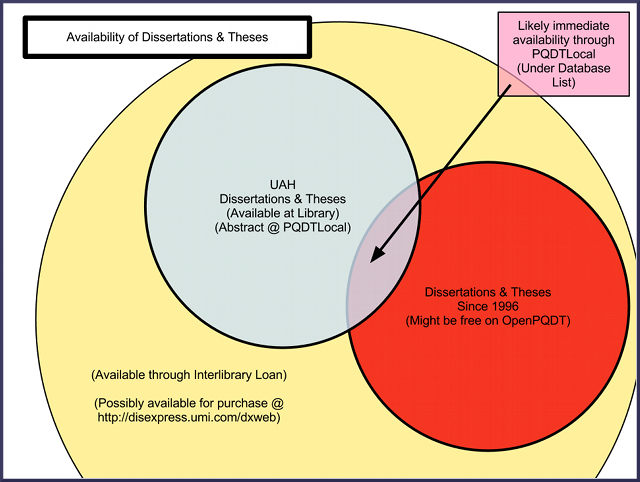 Our subscription to Proquest Dissertations and Theses is limited to those produced by UAH students in the past. It is extremely comprehensive for our works, but will not help you to find those from other universities. What's more, Proquest's PQDT only has electronic copies going back to 1996/1997. Many since then are electronic, but not the ones before then. I've compiled the graphic below to give you an idea about which ones are available where for UAH Students, Faculty, and Staff. For specific ones, there might be greater (e.g., the author posts it to a webpage or online archive) or lesser (e.g., the author requests it not be made digitally available) access.